This episode of Art as Worship is an encore of the interview with Entura artist Patricia Hayes from March 7, 2012. 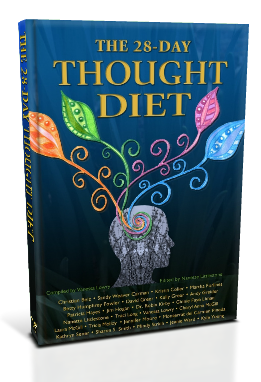 Patricia and Art as Worship host Vanessa Lowry, along with 23 other co-authors, just published a collaborative book titled The 28-Day Thought Diet. Patricia Hayes is an international lecturer, teacher, author and artist. She is the author of five books and has been a pioneer in intuitive and spiritual development for over 45 years. Patricia and her husband Marshall Smith are the founders of Delphi University in McCaysville, GA.
Patricia is also an artist that works in soft pastels. She has developed a technique of channeling art that she has named Entura Art. Patricia has used this method of art throughout her career to establish a relationship with Spirit. Of all her accomplishments, her favorite thing to do is channeling art and teaching aspiring artists this unique technique. Patricia’s encore interview airs on Empower Radio at 9am Eastern on January 30, 2013. You can also download the archived show after it airs. Listen each Wednesday at 9am Eastern on Empower Radio to hear another artist’s story. Share your comments below or on the Art as Worship Facebook page. Namaste! Patricia Hayes is an international lecturer, teacher, author and artist. She is the author of five books and has been a pioneer in intuitive and spiritual development for over 45 years. Patricia and her husband Marshall Smith are the founders of Delphi University in McCaysville, GA. Patricia developed the extensive career-oriented certification and degree programs offered through the University. Patricia worked with the well-known medium Arthur Ford in the 60’s and 70’s, and after his death, in 1974 founded the Arthur Ford International Academy of Mediumship. Today, graduates of the school from 42 different counties use their spiritual abilities for the purpose of channeling, guidance, and healing. In the early eighties, Patricia founded The RoHun Institute which offers an extensive study program in Spiritual Psychotherapy and Transpersonal Psychology for aspiring therapists. Patricia is the founder of selfenlighten.com; a Self Enlightenment correspondence study program. Listen to Patricia’s Art as Worship interview on Empower Radio. Patricia has appeared on numerous television programs including Current Affairs, Unsolved Mysteries, Unexplained Mysteries and Strange Universe. The producer and crew spent time at Delphi University filming Patricia for the Japanese version of 20/20 in Tokyo. Her work has been written about in over thirty books over the last thirty years. She is the author of four previous books: Intuitive and Spiritual Development, Know Yourself, The Gatekeeper and The Extension of Life that she co-authored with her husband, Marshall Smith. Her latest book, Prince Abba and Magi Patiput has just been published. Find out more about Patricia at www.PatriciaHayesArt.com or at www.DelphiU.com.